From today’s harvest….we can’t keep up with these tomatoes! This afternoon, while ponder I was pondering on what to do with this overload of tomatoes ripening daily, and remembered the character Bubba Blue, from the 1994 movie, Forrest Gump. Director Robert Zemeckis won the Academy Award for Best Director for the film, which was based on the 1986 novel of the same name by Winston Groom. Pretty soon I’ll be saying, “dey’s uh…tomato salad, tomato sauce, tomato relish, tomato chutney, tomato paste, stuffed tomatoes, tomato soup, roasted tomatoes, tomato juice, tomato salsa….” HELP! (While we’re on the subject of Forrest Gump—the title track, “Feather Theme,” is one of my absolute favorites. Click here for a video on youtube.com with the music set to stills from the movie. The song was composed by Alan Silvestri. If you haven’t seen the movie, it’s a really (bitter)sweet film with an excellent soundtrack. Apparently at one time in the tomato’s history it paid to be po’ folks (since the poor were the only ones eating tomatoes). Who (whom?) would have thunk it? Tomatoes! Yet another distraction from trying to get back to work after being gone for nine days visiting my family in San Antonio. 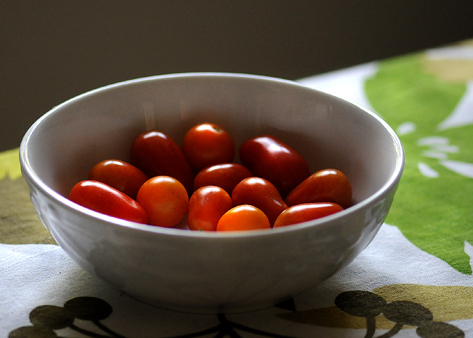 I was working at the computer and caught a glimpse of ripe cherry (and some kind of orangeish in color) tomatoes on the vine outside my studio window…the first harvest of the season. Fifteen smooth, little, intense red gems. Now that I’ve sworn off chicken (in my meander toward vegetarianism), vegetables have become my dearest friends. I even tried cabbage this weekend. Yep. Cabbage. Me. Will wonders never cease? (Of course, it helped that Mom lightly sauted it in a pan in olive oil with a dash of sugar to carmelize it). I even had a few bites of canned cranberry relish, and although it wasn’t unpleasant, I still can’t get past the fact that it still looks like a can when you serve it!. I’ve been completely beef-free for almost twenty years. Rarely ever ate pork. Now chicken-, pork-, and turkey-free for nearly a month. I’ve found I don’t have a craving for the chicken—it was more just a habit and convenience to choose it when eating out. While these decisions are also health-based, they’re coming far more from compassion than any other reason. It was time to go “cold turkey”—pun intended.